Our Court of Honor for the Winter and Spring of 2017 was held of June 14, 2017 at Holy Communion Lutheran Church. 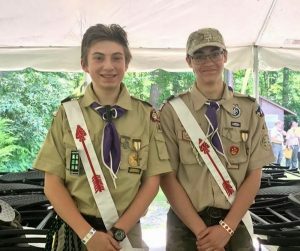 Scouts were recognized for their advancements over the past six months. Senior Patrol Leader Elections for September to December 2017 followed immediately after the ceremony, where James was elected SPL for the Fall. We are trying a new system where SPLs and Patrol Leaders are chosen quarterly by the Troop and Patrols rather than annually, so that patrols are better able to plan around potential leaders availability for periods of time. More pictures to follow once they are passed along! Congrats to John and James for surviving their ordeal and being inducted into the Order of the Arrow this month! Where SPL John decided to get everyone to fall in while he is up a tree, then talks to them. Congrats to John and James on making it through their Order of the Arrow Ordeals! One step closer to the Memorial Wall coming together. Memorial Day Weekend, Troop 48 helped the Berlin VFW place flags on veterans’ graves at the Berlin Cemetery. Afterwards, we went to the Berlin VFW where we held a flag retirement ceremony for the VFW. Finally, the VFW threw a thank you lunch for everyone. Thank you to everyone who came out to the flag placement and/or flag retirement ceremonies and helped out! Big thank you to Assistant Scoutmaster Steve Teti for putting together the flag retirement ceremony and working with the Scouts to run it! On May 24, 2017, Bryan “Skippy” Gillespie passed his Eagle Board of Review, becoming Eagle Scout #121 in troop history! Skippy’s had a great career with the troop, spending a year as Senior Patrol Leader, backpacking over 400 miles with the troop (including Washington State and a two day 50 on the Batona), and planning and building some impressive monkey bridges. Congrats Skippy, we’re all proud of you! Between basic training and deployment to South Korea, Jiff stopped at home and had a party, where he was mobbed by Scouts. Best of luck Jiff! Chase finishes up his Eagle Project at the Berlin VFW, where he painted the face of the building, ripped out fencing, and more. Great work Chase! A cold weekend up at Hickory Run State Forest, were we rafted the mighty Lehigh River.